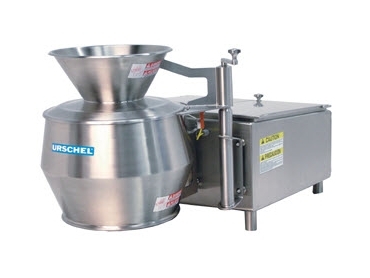 Now available from food processing machinery specialists, Urschel Laboratories , the Model CCX-D shredder is a slicer, shredder and strip cutter all combined into a highly polished design. The Model CCX-D shredder is an ideal machine for to uniformly produce several different types of shreds, including oval, full, “V”, and crescent shreds, from a range of cheeses, vegetables and fruits. It is able to accept products measuring up to 89mm in any dimension. Accepted by the United States Department of Agriculture Dairy Division, all product parts of the Model CCX-D shredder, including the cutting chamber, infeed hopper, impeller, and the cutting head, are highly polished to Ra32 or better to ensure the utmost in hygiene can be kept. Also lending to sanitation and easy maintenance is the attached swingaway infeed hopper. The sheet metal access panels on these shredders are firmly attached to the machine, eliminating the need for removal when cleaning. This not only reduces the cleaning cycle time, but also the chance of panels being damaged. Model CCX-D shredders have a fully-enclosed 7.5 kW motor and also feature continuous operation for uninterrupted production.